Good morning all! 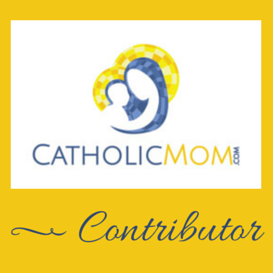 Since today is the first day of the Sacred Heart novena, I thought it was perfect timing to discuss devotion to the Sacred Heart as part of my Catholic Nook series. If you'd like to pray along with the novena, click on the link above to join in! But the Sacred Heart is a devotion that I've always been curious about. As a cradle Catholic, I've heard the concept bandied about for most of my life, and been somewhat familiar with what it means, but nothing official. Then a few years ago, I heard Channing talk about it on her "This Catholic Life" podcast (it's no longer available, as she's a cloistered Carmelite nun, miss her!) and she mentioned that it was her very favorite devotion, which intrigued me even further. So, what is devotion to the Sacred Heart exactly? 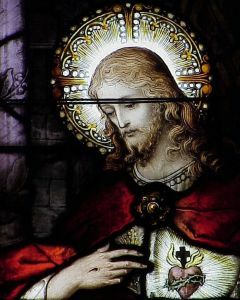 My Sacred Heart is so intense in its love for men, and for you in particular, that not being able to contain within it the flames of its ardent charity, they must be transmitted through all means. During the vision, Jesus showed her a human heart, aflame as if with love. He told her that he would be present with devotees to his Sacred Heart in a special way, and that their devotion would lead to peace in families, conversion of sinners, and perseverance when death was near. On the First Friday of each month for nine consecutive months, receive the Sacrament of Reconciliation and the Eucharist. Attend Eucharistic Adoration for one hour on Thursdays. Celebrate the feast of the Sacred Heart (this year, it's June 12th). This feast will always be on a Friday, and will follow the second Sunday after Pentecost each year. There is a lot of information about this devotion in a book that I reviewed last year, Sacred Fire by Phillip Michael Bulman, if you're interested to read more, as well as at the Salt and Light TV blog. There is also a chaplet that can also be prayed in honor of this devotion. * The Sacred Heart Chaplet has 5 large beads, and then 33 beads that representing the years of Christ's earthly life. Soul of Jesus Christ, sactify me. Heart of Jesus, inflame me with love. Body of Jesus Christ, save me. Blood of Jesus Christ, inebriate me. Water out of the side of Christ, wash me. O good Jesus, hear me. Within Thy Wounds, hide me. Let me not be separated from Thee. Defend me from the malignant enemy. At the hour of death, call me, and bid me to come unto Thee, that with the saints, I may praise Thee for all eternity. Jesus most meek, make my heart like unto thine. We adore Thee, O Jesus, who has been afflicted in the Garden of Gethsemani, and who still in our time are outraged in the Blessed Sacrament by the impious conduct of men. O most amiable Saviour, we recognize that Thou alone art Holy, Thou alone art Lord, Thou alone art Most High. I adore Thee, O most Sacred Heart of Jesus. Inflame my heart with the divine love with which thine own is all on fire. O Lord Jesus Christ, who by an ineffable miracle of love, hast deigned to give Thy Heart to men to serve as their nourishment, in order thereby to gain their hearts, graciously hear our humble prayers, and pardon us for the sins of which we confess ourselves guilty before Thee. Cast an eye of compassion and mercy upon those towards whom Thou dost condescend to direct the affections of Thine amiable Heart. And since we desire to honor Thee in the adorable Mystery of the Altar to the utmost of our power and to render Thee most pleasing Homage and for that intention, weep for and detest from the bottom of our hearts all the outrages, contempt, mockery, sacrileges, and other acts of impiety which ungrateful men in every part of the world have committed against Thee, enkindle therefore in our hearts this divine love which Thine Own is inflamed, and inspire us with sentiments like unto Thine, in order that we may be able worthily to praise for all praise for all eternity the love which which this Sacred Heart burns for us. This our prayer to Thee who lives and reigns with the Father, in unity of the Holy Spirit, forever and ever. Amen. I'd like to get one of these chaplets and add it to my collection, as well as make a recording of the prayers so that we could pray together. Add that to the list! Does anyone else have a devotion to the Sacred Heart? Do write in a comment!